Enriched by our vast industrial experience in this business, we are involved in offering an enormous quality range ofBlender Mixer Machine. TheBlenderis standalone equipment linked with a screw feeder. 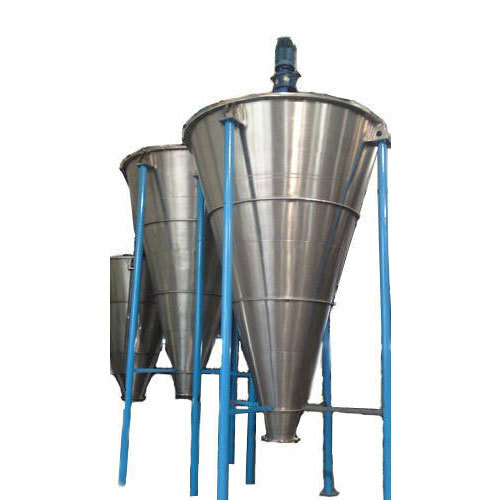 Material feeding is done manually and the conical mixer or conical blender provides a three dimensional action produced by a turning screw which itself rotates around the wall of a conical vessel. This conical mixer and conical blender give better performance than any other mixer in terms of mixing, time taken, quality etc. Gentle action on the product through low power consumption. Fast mixing times with a high degree of mixing accuracy. Self emptying with minimum product retention. Addition / spraying of liquids into material. Granulation or agglomeration of powders by the addition of abinder liquid. Hitec Systems was incorporated in the year 2002, with a declaration to provide the precisely manufactured products to clients. We are a Sole Proprietorship (Individual) owned entity which is performing its occupational activities in a proficient manner in the field of manufacturing. The products spectrum we offer to our customers includes Weigh Feeder, Weighing Machine, Check Weigher, Cooling Drying System, Boiler area equipments, Electrical power panels, control panels, Conveyors, screw conveyors, bucket elevators, Bagging systems, and many more. We are dedicated to constant improvement and up-gradation, which helps us to evolve in totally and assist to take our company on new heights. We are also providing Control Panel Repairing Service and more.